The Ranger 800 Crew UTVs from Polaris Industries are 4x4 all-wheel drive utility vehicles with more enhanced features, functions and capabilities. Ranger 800 Crew UTVs offer 20% better fuel efficiency than the previous year’s model in addition to 20% more headlight power with high/low switch operation. Featuring an 800 twin EFI engine, the 4x4 UTVs offer 1-tonne towing power and high ground clearance making them suitable for all terrain driving. 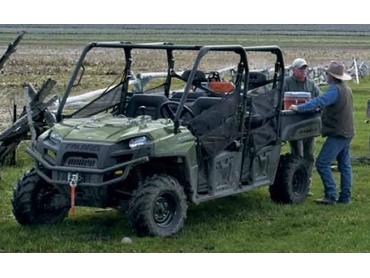 New driver and passenger side nets have been provided for greater safety while the Ranger’s proven IRS system offers a comfortable and smooth ride. The Ranger 800 Crew has an oversized glove box, three huge open compartments and space for smaller items, offering more total storage than competitor models. An extra-large storage box of 106-litre capacity is also provided with divider slots under the seat. The Ranger 800 Crew features a fully adjustable 4-corner suspension system. The dual A-Arm with exclusive top mounting-point adjustability can be changed to softer setting for trail riding or stiffer setting for heavy duty work. The utility vehicles also incorporate the legendary and proven smooth independent rear suspension (IRS) with the longest suspension travel in its class to keep the ride smooth. Adjustable preload and two top-mounting points for each shock allow the user to stiffen the suspension for heavier loads.